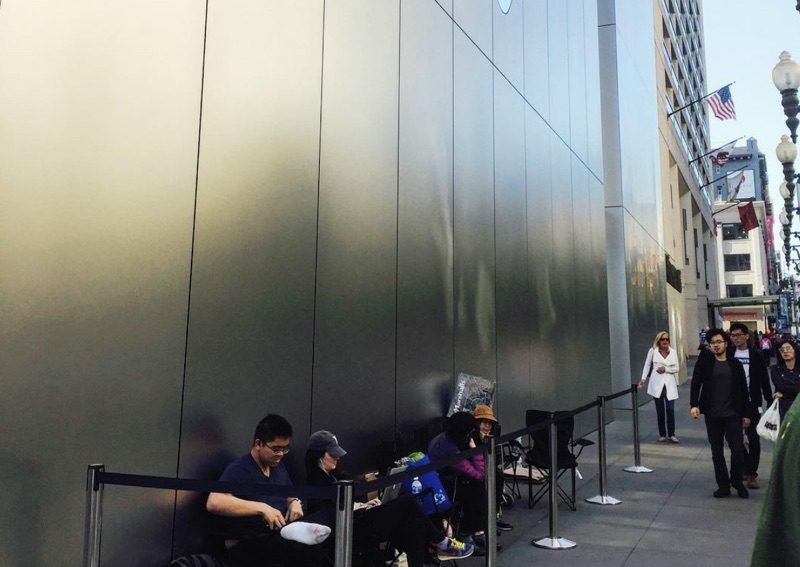 With just two days to go until the official launch of the iPhone 7, customers who are hoping to get their hands on one of Apple's devices have started lining up outside of Apple retail locations around the world. 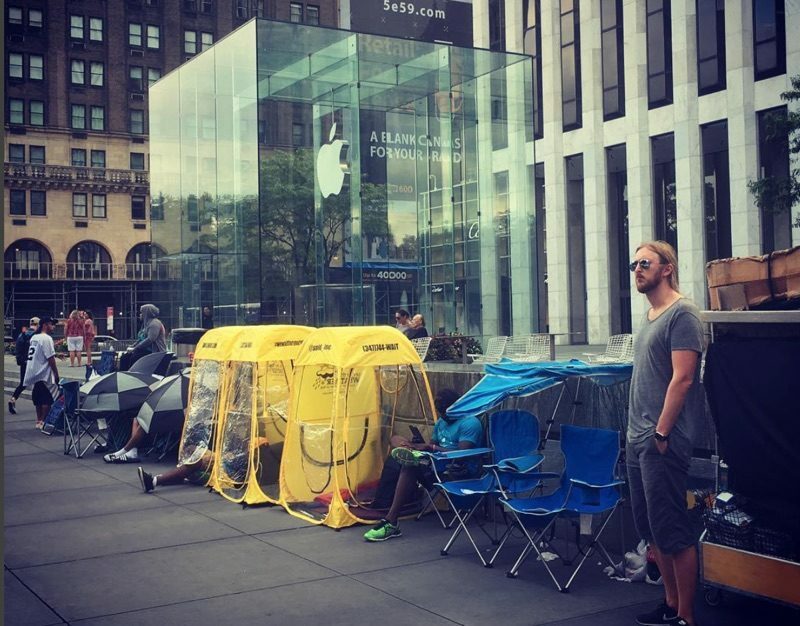 At the 5th Avenue Apple Store in New York, one of Apple's flagship locations, people have been waiting in line for days, saving spots with folding chairs and small one-person tents. Other stores in New York also have short lines at this time, based on photos sent in by MacRumors readers. At Apple's new San Francisco location, Apple Union Square, a handful of people are already waiting outside for an iPhone 7. People started lining up over the weekend. At the Summerlin Apple Store in Las Vegas, MacStadium's Brian Stucki set up a webcam to monitor the crowd situation. No one is waiting in line yet, but it should be a fun way to watch how activity progresses over the course of the rest of the week. Shipping estimates on some of the most popular Black and Jet Black iPhone 7 and 7 Plus models range into several weeks and last until November in some cases, so waiting in line on launch day is the only way to get one of the highly coveted devices if you missed out on pre-orders. The iPhone 7 and 7 Plus launch on Friday, September 16, and will debut first in Australia. It's Thursday morning in the country, so there's just a day to go until people start getting their hands on devices and sharing videos, pictures, and first impressions. Pathetic how obsessed and bought off people have become with gadgets and gizmos. To be honest, I don't get it either. But, who are we to criticise someone else for doing something they enjoy just because we can't see the point/value. I mean, I'm sure there are people queuing for hours sometimes days for other big occasions like sports or music events. I really don't understand why? The 7/7s is so readily available that most carriers are giving them away with a free tradein. I guess just to be first to have it, and then test it's waterproof-ness on youtube. and then have apple deny the warranty claim. and we also need to bend it. Have there ever been queues like this for an Android phone? Yes, the fire extinguisher line for the Note 7. I don't understand waiting in lines for days. I mean I'm a huge apple fan and its fun to have the latest stuff but its like... I got work and school. Is this truly the definition of having too much time? Apple fans are just like sports fan. They get line to get the product/service they want. Yes everybody knows we can just preorder from the comfort of our bed, but the people who wait in front of the stores do it for the experience. I don't understand how people just gotta be rude to die hard fans. Why not just reserve a phone online like regular people. How do unemployed people buy a phone anyway. who told you they're unemployed? Why does everyone care if people stand in line?? I don’t understand it myself, but I’m not going criticize whether they have the time available or if they’re unemployed, or whatever other ridiculous argument to come up with. These actors are paid by Apple. Designed in California. Assembled in the street gutters.